Several religious and Utopian colonies were founded in the Midwest in the early 1800s: the Mormons and Icarians at Nauvoo, Illinois, the Jansenists at Bishop Hill, Illinois, and the Rappites and Owenites at New Harmony, Indiana, to name a few. In the southern Illinois town of Vandalia a different kind of colony was organized. Ferdinand Ernst, a wealthy German agriculturalist, organized, funded, and conducted a group of nearly one hundred German colonists to Vandalia in 1820. His colony was different from other midwestern groups in a very important aspect: the Germans at Vandalia were not organized around any religious or Utopian principle. They were a group of impoverished Europeans who temporarily obligated themselves to Ernst in exchange for Atlantic passage and settlement in Vandalia. The compassionate vision of Ernst earned him praise from people who observed his leadership. Sadly, the colony's success was short-lived. Ernst encountered a number of difficulties after he and the colonists arrived, and his early death in 1822 hastened the breakup of the group. Ernst was born about 1784 in the city of Trier in the Rhineland. We do not know the exact date, although 1820 ship records listed his age as 36. We know little of his early life. His father was a wealthy farmer who accumulated several large estate farms for his children. Ferdinand lived on and farmed an estate in the German state of Hanover with his wife, Mary Ann and their three children, Hermann, Rudolf, and Augusta. By the mid-1810s the Napoleonic wars had left the German states in economic and social crisis. At that time, Germany was not a unified nation, rather it consisted of several small states in a confederation with a fixed social order of peasants, wealthy nobles, and the middle class. In addition to the ancient social classes, growing industrialization divided people between those who remained in the rural areas and those who went to work in industry. Many Germans looked to the United States as an example of political equality, national unity, and economic opportunity, but German rulers actively discouraged movements for political and economic freedom. Many Germans, including many of the rural, impoverished Ernst colonists, hoped that emigration to the United States would solve their problems. A very large numbers of Germans emigrated to the United States in the 1830s and 1850s. Many Germans returned home disappointed, but some sent back word of success, fueling the hopes of others. Even as early as the late-1810s, poor harvests and high food prices led many Germans to consider moving to the United States. The Ernst colony was thus an early example of the course taken by many more Germans in the nineteenth-century. As an upper-class person of means, Ernst resolved to assist as many persons as he could by funding their passage to the United States on the condition that they repay the loan through indentured labor. One of Ernst's friends, Ludwig Gall, who was also guided by a compassionate, philanthropic vision, assembled his own colony bound for Harrisburg, Pennsylvania. the future city . .
sessions for forty-five thousand dollars and I am going to America to found a colony, and I wish you to go with me and you shall have a good share of my enterprise. Make any sacrifice in order to be able to accompany me." Hollman agreed to the extraordinary request. In Hollman's autobiography, written in the 1870s, he recalled that "I was always treated like a brother by both Mr. and Mrs. Ernst and a friendship grew up between us which only terminated with death ... I had before me constantly examples of piety, charity, benevolence, and strict honesty." 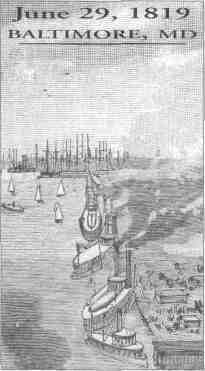 On March 29, 1819, Ernst, Hollman, and other men boarded a ship to the United States. They landed at Baltimore, Maryland, on June 29, visited Washington, D.C., and traveled west by stage to Wheeling, Virginia (now West Virginia). There they purchased horses and followed a trail down the Ohio River, meeting other German immigrants along the way. Ernst heard the stories of several Germans who had emigrated as indentured workers; such formerly impoverished Germans, Ernst was pleased to report, had become economically successful in their own right. Once in Illinois, Ernst noted several things in his journal: the unbearable flies and summer heat, the frequency of grass fires on the prairie, and the corn which grew twelve to fifteen feet tall. Ernst found American customs perplexing: Americans failed to remove their hats before shaking hands with a stranger, he noted. But he also observed the friendliness and hospitality shown to him and his friends. Illinois Governor Shadrach Bond entertained Ernst at a fine reception at the capital city of Kaskaskia. with benevolent American government and fine culture. He wrote, "How difficult it was at that time to penetrate the dense forest which embraces the entire circuit of the future city ... But how it will have changed in ten or twenty years! All these huge forests will have then disappeared, and a flourishing city with fine buildings will stand in their place. A free people will then from this place rule itself through its representatives and watch over their freedom and well-being." 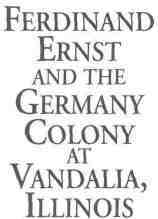 Ernst purchased property at Vandalia and assigned Hollman to remain there to prepare for the colonists while he returned to Germany. Once home, Ernst published his journal in order to attract colonists and show them the opportunities for prosperity and freedom in Illinois. The book was entitled Observations on a Journey through the Interior of the United States of America in the Year 1819. "If poor people wish to undertake the journey to America," Ernst wrote, "they do best to unite into as large a company as possible and to choose as their leader someone who has their confidence and who is equal to this undertaking." Soon he had gathered about one hundred Germans, including his own family and a Lutheran minister, and prepared to set sail during the summer of 1820. Many of the Germans had agreed to serve three-year indentures to Ernst. While Ernst made preparations, Hollman was hard at work constructing buildings for the colonists. In his autobiography he stated that, although he knew little English, he managed to hire crews of settlers to handle construction. He found materials, food, and goods in St. Louis, and he also hired a Vandalia woman to sew quilts, sheets, and bedding. Once a mill was established near Vandalia, Hollman obtained walnut planks for the buildings. He also completed a kiln for making bricks. By the autumn of 1820 Vandalia was transformed from a cleared spot in the woods to a busy village. Hollman was but one builder among many; enterprising settlers from Kentucky and other parts of Illinois were arriving in Vandalia to set up residence. Homes and stores were built, hotels and boardinghouses were readied for state officials, and a temporary state capital was constructed. The state's major newspaper, the Illinois Intelligencer, opened its office at Vandalia after the editor moved his printing equipment from the former Illinois capital, Kaskaskia. Early in December 1820 the Illinois General Assembly convened in Vandalia for the first time. Hollman completed an enormous amount of work by December, and in his autobiography he expressed satisfaction with the results. Without word from Ernst for many months (Ernst's last letter, dated February 14, arrived to Hollman in May), he busied himself with his local hotel and grocery business. Unbeknownst to him, Ernst and his colonists arrived in the United States in October, making their way to Vandalia in a two-and-a-half month overland trek from Baltimore. The Germans rode across the country in four wagons, bringing along a few belongings, including musical instruments. 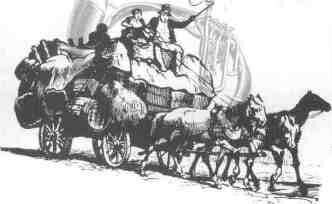 Ernst had hired a group of teamsters to transport most of the colonists' belongings by land and river to Illinois. hardship and anxiety." Townspeople swarmed into the streets as the travelers proclaimed three cheers for the state of Illinois. Many of the colonists found success in Illinois. Several worked out their indentures to Ernst in only four months. The laws of Illinois allowed for the assignment of impoverished persons to indentureship. Although these laws could be highly exploitative of persons, Ernst hoped to make temporary use of them to assist immigrants in gaining economic freedom in the new land. Some of the Germans married Americans or other colonists, and a few found their promised economic betterment. Frederick Remann, George Leidig, John Frederick Yerker, Henry Snyder, and others settled in Vandalia permanently. Later in the 1800s, Leidig's son became mayor of Vandalia, and one of Remann's grandsons was elected an Illinois congressman. Hermann Ernst, the oldest of the three Ernst children, also settled in the capital. Of the Ernst children, he is the only one known to have descendants in the Vandalia area. Ferdinand Ernst was elected to Vandalia's board of trustees and appointed a director of the state bank. He also established a large farm near Vandalia and began work on a mill on the Kaskaskia River. Hollman remembered that he, Ernst, Pastor Smith, and Mary Ann Ernst performed the music of Beethoven, Haydn, and Mozart on warm evenings. But not all the colonists shared in the success. Several of the Germans died of illnesses endemic to the region. One man drowned while swimming the Kaskaskia River, and another perished in a prairie fire. Pastor Smith died of a stroke, hastened, Hollman thought, by despair over the suffering and dying Germans. Disloyalty to Ernst joined with illness to destroy the community. Some of the Germans reneged on their obligations to Ernst and fled town or otherwise rebelled. Apparently Ernst was a forceful person, more accustomed to the class structures of Europe than the egalitarian society of the U.S. One historian wrote, "In America, the emancipated dayworkers and farmers ... after drinking from the fountain of freedom, did not want to tolerate any longer the absolute peremptory commands of a German magistrate, which Ernst should have thought about beforehand." But the Intelligencer editor praised Ernst for his compassion and leadership, urging cooperation with him. 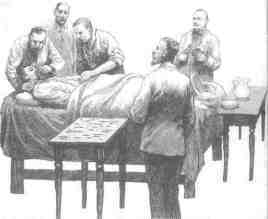 Ernst took ill of what pioneers called "bilious fever" (probably typhoid) during the summer of 1822, and he died on August 19 at age 38. Without Ernst's leadership, many of the remaining emigrants left Vandalia forever. Frederick Hollman left Vandalia early in 1827, calling it "a most dull and miserable village." Mary Ann Ernst lived in Vandalia until her death in 1841. The Vandalia colony is a sad chapter in the history of Illinois. Ernst's gesture for the betterment of his fellow Germans was short-lived. But his legacy is the social conscience that gave his colony a foundation. His colonial venture remains an example of compassion and self-sacrifice, if also one of tragedy.